Increasing material and labor costs throughout the 1970s drove more than a few boatbuilders and importers to Taiwan as a source of cheap labor and abundant resources. The quality of the boats that resulted varied greatly, but few, if any, have ever measured up to the quality of those built by Little Harbor Custom Yachts. The Little Harbor 46 is one of several models designed by the legendary Ted Hood and built by the Hood-owned and operated builder. The model was introduced in 1986, and although some reference materials show it was offered through 1994, the last of the series was built in 1991. She was offered with either a sloop or yawl rig and with a choice of center or aft cockpit arrangements plans. The sloop-rigged, center cockpit model was, by far, the most popular. Aft cockpit models are rare, and I have never seen anything other than a drawing of a Little Harbor 46 with a yawl rig. In the late 1970s, when Little Harbor first moved their building operation to Taiwan, they chose to have their boats built by an established boatyard but soon found they had little or no control over the quality of the boats being built. So they chose to start up their own yard in which they could exercise total control over quality and production schedule. Unlike most cruising boats of the time, Little Harbors were built with core-composite hulls. And, in another departure from the norm, they chose Airex foam for hull and Divinicell foam for the decks rather than more conventional balsa wood. Their rationale for choosing cored construction over solid laminates was to improve sound and thermal insulation rather than reduce weight, so fiberglass skin thickness remained quite substantial resulting in what is, for its length, a heavy boat. In fact, if there is one thing Little Harbor seemed to lose control over, it was the “as built” weight of their boats. The original design specifications for the Little Harbor 46 indicated a designed displacement of 32,500 pounds and a “board up” draft of five feet, while the “as built” specifications of the last 46 built list a displacement of 47,000 pounds and a “board up” draft of five feet eight inches. Nonetheless, these are exceptionally well crafted boats and their quality, particularly the joiner work, rivals that of any custom boatbuilder or cabinetmaker anywhere in the world. The on-deck layout is well suited to offshore sailing with secure teak overlaid decks, a large unobstructed foredeck, substantial teak toe rails, large dorades for good ventilation below, even in foul weather, and secure rails and life lines. A downside of the arrangement is that the cockpit, on both models, is quite small for a 46 foot boat and obstructed by a large helm console and fixed drop-leaf cockpit table. Because the Little Harbor 46 was built on a semi-custom basis, it is quite common for interior arrangements to differ slightly from boat to boat. Generally the plan follows a standard layout with V-berth cabin, head and hanging locker forward followed by the main saloon with starboard dinette and port settee. Water and fuel tanks are fiberglass, below the berths and the cabin sole and integral with the hull in order to maximize the use the area below the cabin sole. Auxiliary power has been provided by both Westerbeke and Yanmar marine diesel engines, most with constant velocity (CV) drives installed between the engine and propeller shaft to ensure minimal vibration. Access for service and maintenance is good, and there is room forward of the engine for an auxiliary generator. Hood has long been an advocate of heavy displacement, centerboard boats for their sea-kindly nature in severe conditions. In keeping with that philosophy, the Little Harbor 46 is no lightweight. Although the number varies quite a bit depending on the weight of each boat, the displacement/length ratio is certainly well over 300. That said, a well-designed, heavy boat is not necessarily a slow boat, and almost no one has more experience than Hood when it comes to deigning this type of boat. He is meticulous about the lowest possible wetted surface area, hull shapes that minimize wave-making resistance and low prismatic coefficients, all essential factors to making a heavy boat go fast. Like all heavy boats, the Little Harbor 46 suffers when it comes to acceleration, and she’s not likely to win a tacking dual against a Farr 40. But there are few, if any, boats of this size that will be more comfortable at sea. 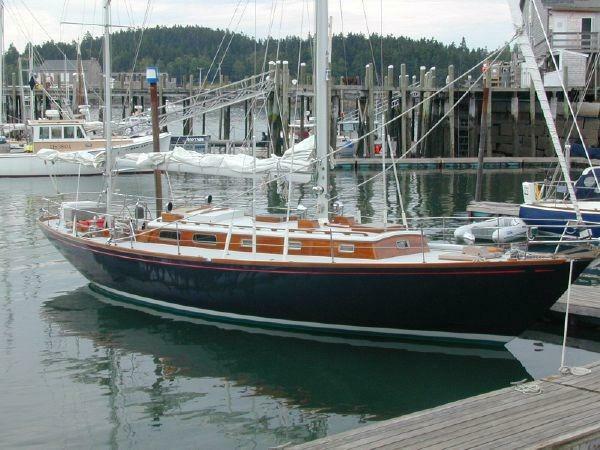 Although there were only 21 Little Harbor 46s built over the years, most often there is at least one offered for sale somewhere, although you may have to travel a ways to get a look. According to the 1986 publication A Sailor’s Guide to Production Boats, the base price of a Little Harbor 46 was $241,150, but that may be the last time anyone could have purchased one of these boats for so little. The average selling price of the last five sales reported by soldboats.com is $427,000 with a range from $350,000 to $595,000. While this may seem like a lot of money for a 20-year-old boat, the cost to build a new boat, of this size and quality, would be well over a million dollars. And, boats sold at the upper end of the price range are typically maintained in nearly new condition. No doubt Little Harbor 46s will be turning heads for years to come, and the fortunate among us will have an opportunity for a close-up look or maybe even a Newport to Bermuda race, in nasty weather, to appreciate this classic.